Getting in your 5-a-day is more important than ever in winter, helping to keep your immune system healthy and fight off those winter colds! There are plenty of delicious vegetables in season in January, so in this month’s blog post we’re focussing on one of our favourites. Eating produce that is in season means that it often tastes better, fresher and avoids overseas shipping! From Creamline’s Greengrocer range, you can be sure of the freshest, most delicious produce, local and handpicked from Manchester’s Smithfield Market. 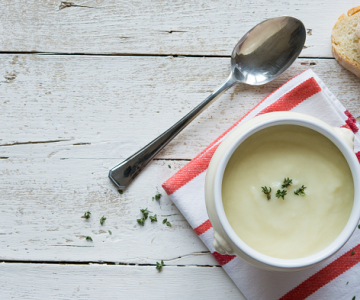 Read on to find out how to use one of January’s best offerings; parsnips! Fry the diced onion in the butter until soft and then add the parsnips, garlic and curry powder. Fry all the ingredients over a low heat for a couple of minutes to release all the flavours then add the stock to pan and stir well. Simmer the soup for 15 minutes until parsnips are soft. Off the heat blend the soup with a hand mixer or food processor until smooth. Stir in the cream and season with the salt and pepper. Serve with a sprinkle of paprika and chopped coriander.